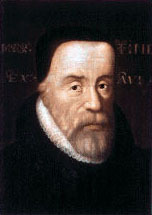 Tyndale was a theologian and scholar who translated the Bible into an early form of Modern English. He was the first person to take advantage of Gutenberg’s movable-type press for the purpose of printing the scriptures in the English language. Besides translating the Bible, Tyndale also held and published views which were considered heretical, first by the Catholic Church, and later by the Church of England which was established by King Henry VIII. His Bible translation also included notes and commentary promoting these views. Tyndale's translation was banned by the authorities, and Tyndale himself was burned at the stake in 1536, at the instigation of agents of Henry VIII and the Anglican Church. A clergyman hopelessly entrenched in Roman Catholic dogma once taunted William Tyndale with the statement, "We are better to be without God’s laws than the Pope’s". Tyndale was infuriated by such Roman Catholic heresies, and he replied, "I defy the Pope and all his laws. If God spare my life ere many years, I will cause the boy that drives the plow to know more of the scriptures than you!" 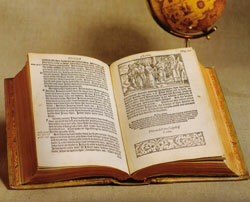 Tyndale was the first person to print an English language New Testament, doing so in 1525-1526. Only one complete copy of this first edition is known to exist, and the British Museum paid $2 million for it in 1948! Tyndale’s illustrated New Testaments of the 1530’s were even more spectacularly beautiful, and they went through several editions and printings. One year after Tyndale’s execution in October of 1536, Tyndale’s friend John Rogers, operating under the assumed name "Thomas Matthew", produced the 1537 "Matthew-Tyndale Bible". This was the very first printing of a complete English language Bible to be translated directly from the original language of Greek and Hebrew. It was reprinted once again in a more practical size in 1549. Originals (both whole books and individual leaves) and facsimile reproductions of these works are available today. View Tyndale Bible and New Testament material available today. Read more about the history of William Tyndale.